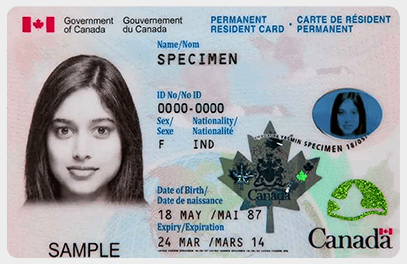 The Canada Permanent Residency Card indicates permanent resident status by the government of Canada. It provides the actual proof the holder is in fact a permanent resident of Canada, and can therefore freely leave and re-enter Canada as often he or she likes. ext to the Canadian Citizenship Certificate, the Permanent Residence Card (PR Card) is probably the most coveted piece of identification denoting status in Canada that a foreign national can obtain through designated programs and procedures under the Immigration and Refugee Protection Act (IRPA). We are frequently asked a variety of questions by individuals confused about how their own PR Card, or a relative’s card, works. They need to know what freedoms and responsibilities the PR Card confers on the holder. Let’s dispel fears about residency obligations of PR Card holders, and outline how to act prudently in common situations, so as to protect your precious residency status if you currently hold a PR Card, or whenever you finally get one. What is a PR Card? A PR card is issued to an individual who has been given permanent resident status by the government of Canada. It provides the actual proof the holder is in fact a permanent resident of Canada, and can therefore freely leave and re-enter Canada as often he or she likes. If the PR Card holder has a family whose names were identified in the initial application for permanent residency and are now living in Canada, then it is likely that they too are permanent residents, and will all have individual cards. Even a child will have his or her own card. A new permanent resident and accompanying family members, once they have arrived in Canada or “landed”, will receive their PR cards in the mail. This is part of the immigration process, and therefore such individuals will not have to make a separate application for their first card. Q: What are Canada’s Residency Obligations? A: Once a person has been granted permanent residence status in Canada there are several obligations, the most important of which is to live in Canada for two years out of five from the date of landing in Canada. After five years, and if that person has not yet become a citizen, that person is obligated to prove to the government (IRCC) that he or she has lived in Canada for two out of the last five years (730 days). There are certain circumstances whereby the government will consider as applicable days, a time period that happen to be outside of Canada for prescribed circumstances and situations. Q: What does a PR card allow you to do? A: This card provides you authorization to travel and enter Canada legitimately from anywhere in the world. It also allows you to work freely anywhere in Canada, making any previously issued work permits redundant. In all circumstances, where such is required, it is proof of your status as a permanent resident of Canada. It is imperative that you protect and secure the PR card at all times. This is especially important if you are travelling abroad. Without showing transportation and security officials a valid PR card, you will not be allowed to board a flight or travel to Canada via any other means such as train, boat or coach. Q: What if my PR card has expired or is lost? A: If your PR card has expired or is lost and you are outside of Canada, wishing to return, you will have to apply for a Permanent Resident Travel Document. This document will allow you one single entry into Canada, after which you must apply for a new PR card. Such an application is normally made through Canada’s Embassy, Consulate, High Commission, or the Visa Application Centre (VAC) in that country. Q: What does the PR card not allow you to do? A: Although permanent residents of Canada are allowed to live in any province or territory, to access national and provincial healthcare, seek protection under the Canadian Charter of Rights and Freedoms and to travel in and out of Canada anytime, there are two things such individuals are not allowed to do. Firstly, permanent residents are not allowed to vote for and to run for public office anywhere in Canada. And secondly, they may not be eligible for certain jobs that require a high level security clearance. Individuals in Canada on a temporary basis for purposes of visiting, studying or working, are not permanent residents. They cannot be issued PR cards. However, students and foreign workers may eventually qualify to apply for permanent resident status, providing they fulfill their current obligations, abide by the laws of Canada, and meet the requirements of specific programs and initiatives of federal and/or provincial governments. The process of transitioning from one status to another is not simple, and requires strategic planning along with a sound understanding of rules, regulations and procedures relating to the IRPA. Q: What is the best advice to PR Card holders? A: As soon as you are eligible, you should seriously consider applying for Canadian citizenship. When you become a citizen, you are able to participate in that democratic process of electing people who make policies, enact laws and shape our communities, municipalities, provinces and territories and Canada as a whole. As a citizen you are a full-fledged citizen of a country that is the embodiment of progressive thinking, promotes peace and harmony amid diversity. Isn’t that why you came to Canada in the first place?